The Logs come rolling in! This is one of my favorite places about half way between Leetonia and Cedar Run. 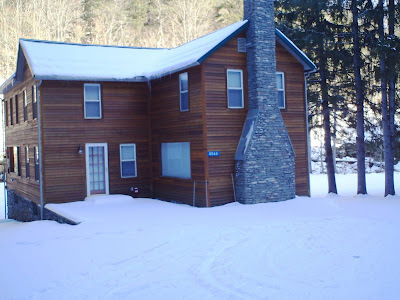 The cabin was hand built with local logs in the early 30's. I am sorry I don't have the man's name who built it. The whole place is about 16' x 20' a one room cabin with an outhouse. Enjoy the video. Mountain girl, Paula, logging out. Here is a little video I took traveling down the road in the chained up Subaru. You will hear the sound of the chains clicking down the road. Lee was driving. It was a little dark and the wind affected the sound at one point, but you get a little taste of these roads covered in snow. I shot this about a half mile before Mine Hole Rd going South on Leetonia Rd. 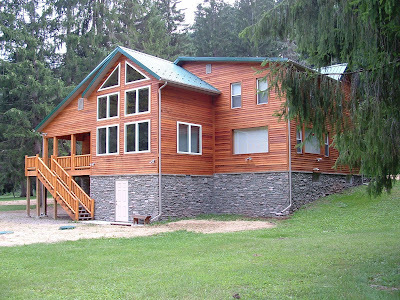 to Cedar Run. Have fun hanging on with us. Mountain girl, Paula logging out. 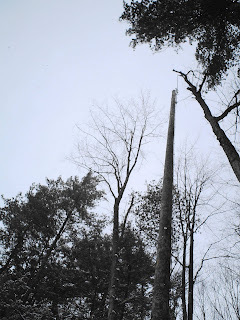 A large pole appeared two days ago about 200 yds up Leetonia Rd. from 414. There is an antenna attached to the bottom and some control boxes. The notice attached to it says it is a communication system for PennDot and the State Police. It always seems weird to see something like this sprout up in the middle of nowhere. I guess they don't like not being able to use cell phones here or much of anything else. It will be interesting to see how well this system works. Mountain girl, Paula logging out. THE NATIONAL WEATHER SERVICE IN STATE COLLEGE HAS ISSUED A WINTER WEATHER ADVISORY...WHICH IS IN EFFECT FROM 1 AM FRIDAY TO 1 AM EST SATURDAY. A WINTER STORM WILL MOVE UP INTO THE STATE FROM THE SOUTHWEST TONIGHT...AND LINGER THROUGH EARLY SATURDAY MORNING. SNOW WILL DEVELOP AROUND MIDNIGHT AND CONTINUE THROUGH THE DAY FRIDAY INTO FRIDAY NIGHT. SNOWFALL AMOUNTS WILL RANGE FROM 4 TO 6 INCHES BY FRIDAY NIGHT WITH A FEW AMOUNTS UP TO 8 INCHES OVER HIGHER TERRAIN. Currently it is icy and you need chains anywhere the road isn't plowed. I expect a bunch of snowmobliers this weekend if we get the snow that is promised. Have a great Leetonia day. Mountain girl, Paula, logging out. For those of you who would like to know the road conditions this picture should help. I am generally pretty cautious on these roads and chain-up when it is slippery. But I think having the roads plowed and salted this year made me lazy. I thought I could sneak through a section that wasn't salted. I did once, but on the way back on Leetonia Road just before Micks I felt my truck swerve dangerously close to a 50' drop-off. I was able to keep it away from the drop off but the mountain jumped out and bite my bumper. Once the mountain had a grip on my bumper I felt the rear of my truck pass me and I found my self in the ditch facing the opposite way. I got out to inspect the damage and see how I was going to get out. I walked to the back of the truck and both feet flew out from under me, I hit my elbow hard and then my head. "Yes, Paula it is icy," I could hear my truck say. At this point some cursing was involved and I sat in my truck and cried a little pity party for myself. I knew no one would be coming to my rescue. Lee wasn't home, cell phones don't work, and there isn't anyone driving this road (some people are smart enough not to drive on these roads). So, I gathered up some courage and got out again with more caution. The bumper was pushed into my tire. I needed something to pry it off. I walked up to Micks and borrowed a shovel and a crow bar. I was able to free my tire from the bumper and I shoveled under the tires and tried to back out of the ditch. My rear tires spun on the ice. I got out my chains and placed them on the ground in a line behind my tires this gave me just enough grip to get out of the ditch. I gathered up the chains and drove slowly backwards to Micks driveway were it was salted and I could turn around. I realized how lucky I had been. If I had gone over the edge and been hurt the single digit temps would have not treated me kindly. Lee was in New York and didn't get home that night until 11:30PM, which means no one would have looked for me for twelve long cold hours. One good thing is she would have known where to look, since we keep track of each other very closely for just this reason. So today when I got up with a bruised swollen elbow, a broken truck and a bruised ego. I could still feel lucky. So, warning if you are coming up wear chains. Also we are having more snow Friday so the road conditions could change. Right now it is icy, rutty, and a bit mean out there. Drive careful I don't need any members to my truck smashing club. Mountain girl, Paula, logging out! Here is another picture from the files of Fran Weigley. If you know any of the missing names for people in this picture let me know. Left to right. 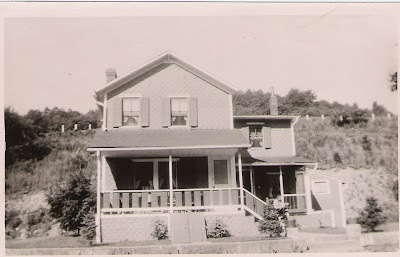 This was taken in the early thirties in Leetonia. Before I start this article, I want you to know I updated the previous article to include a front picture of the Wilsbach camp so you all can compare it easier. This weekend being long and the first one we have had enough snow to snowmobile for a while has encourage a constant stream of snowmobile traffic. Today the weather is going bad with rain and freezing rain which is going to put a damper on the good times. 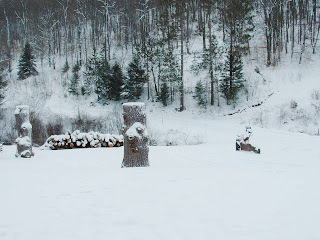 The first picture shows a few of the snowmobiles at the Sunlight Gun Club just a few hundred yards up the road from me. I took it yesterday during a nice sunshine streak and everyone was in a good mood. I have decided to attached a copy of my first years experiences up here snowmobiling for you all to enjoy. 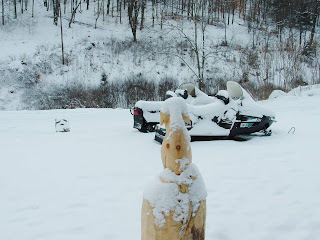 A few things changed this year as we now do not have to depend on the snowmobile to get out since the road is plowed, which has been a big relief. Enjoy and have a great Leetonia Day! Living in the backwoods seven miles off plowed roads requires some planning for emergencies. One of these plans was to have a snowmobile to ride out to get the mail and to the car parked at the plowed road. I will be the first to admit I knew nothing about snowmobiles. I only knew I wanted one that could carry two people and be reliable. I hoped to spend $500 on a nice used one. That dream was quickly shattered, $500 machines looked like they might be better as lawn ornaments than something to ride. In October, we found the machine we wanted a two-seater 95 Polaris with reverse. Tax, licenses, and two helmets it came to a little over $2000.00. Over budget, but confident we had a machine that would get us out of the woods when we needed it. We hauled it home. On a warm October day we put our helmets on and climbed onto it waiting for the snow and glad no one drove by to see us. The snow started early in November and by December we had enough snow to give it a try. I went to start it. Nothing. Time to read the owner’s manual. After following all starting instructions to the tee, I figured the battery was dead. So I placed it on the battery charger and impatiently waited. Once charged it started sputtering slowly getting warmed up ready to run. I looked down and noticed it was frozen to the ground. Now I had to get it loose. I pried, jumped, pushed and finally freed it from its icy prison. Ready to move, I found the large beast needed a large area to turn in and I spent as much time backing up as going forward. Then I started down the road, trying to get used to a feeling of being bumped and slide along with the forward motion. Okay, I thought, lets see where it will go. Six inches of soft snow had fallen over ground that wasn’t totally frozen. Snowmobiles can go anywhere there is snow. I reached the top of our mountain and decided to divert from the trail. As soon as I went off the trail I noticed the snowmobile slipping more and more I decided to head back up to the trail. I started to spin a hole through the snow to the ground below and came to a stop. I couldn’t go up and looking down at the steep slope below decided not to go down. I got off and pushed. The sled was heavy and I could only move it about six inches at a time. After about forty-five minutes I had uncovered more dirt and moved in the wrong direction. Discouraged, I turned the machine off and walked back to the cabin. Fortunately, we could still drive our Subaru up the hill not far from the snowmobile. Two people pushing and driving the snowmobile freed it up. Lesson one: Don’t drive in deep or soft snow. When the snow packed down it was easier to drive the snowmobile. The forecast was for freezing rain. Rain matted the snow down into a wet slush and then a temperature drop froze the whole mess. I broke the snowmobile loose from the ground again and started it. The skags gritted against the ice and the machine seems to bounce from rut to rut. I ran between five and ten miles per hour and tried to drive on any snow I could see left by the storm. Then I hit a slight incline of pure ice. The snowmobile started to go sideways towards the drop off side of the road. I slowed to a stop and stepped off the snowmobile to inspect the situation. I hit the ground as fast as my feet touched it. Half holding the snowmobile I pushed and slide it to a small piece of gravel and got it past the ice. Lesson two: Snowmobiles do not like ice. Later, I found out you can have ice spikes put in the track that helps with this for about $300. 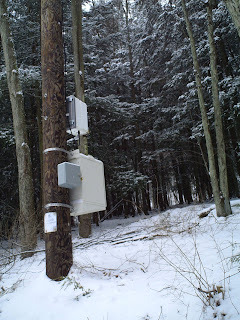 I am an avid cross-country skier and we have a lot of nice trails near my house. However, storms have a way of littering them with trees. I decided the snowmobile could carry with my chainsaw and gas to the sites I needed to clear. I cleared the first trail without problems. The second trail was narrow and had several trees across it. I cleared them and tried to put the snowmobile in reverse it wouldn’t go. I moved the lever back and forth several times without luck. This meant lifting the beast around. I tugged at the skags and inched the rear over until I thought my back would break, and headed back. Then the snowmobile started making odd sounds. Clinkty, clinkty, clank, and it came to a fast skidding halt. The track wouldn’t move. I got out and looked for any foreign objects stuck in track and found nothing. I pushed and shoved it. It wasn’t going to move. I turned it off and carried my chain saw the half of a mile home. Tired and with little knowledge of snowmobile mechanics. I went home and called the dealer. “Did you check the track?” He said. I hung up the phone and realized my car was seven miles away and I would need it to get parts and oil for the snowmobile. “I’ll walk out.” Lee said offering to make the seven-mile walk. Walking out of here is no small task. It’s not a leisurely seven-mile walk. It is an up and down mountain walk in snow. I put on my best hiking shoes and a backpack filled with water, extra snow clothes and the mail to go out. I left at 1:45 pm. Snowmobiles roared past me constantly. At 3:15 pm I was close to the top of the first mountain. I’d only gone two and a half miles. I still had five and a half to go and it would be dark by 5 pm. If one of these snowmobilers slows down, I’m going to hitch a ride. No sooner had I finished that thought then one did slow down and I asked him to drive me out to the road. I’d been dressed for walking not riding a snowmobile. I didn’t have a helmet and wore light hiking clothes. I got on the back of this machine and we were off. I soon realized I had chosen the ride from hell. I am a conservative snowmobile driver. The fastest I ride a snowmobile on these roads was 25 mph, which is the car speed limit, and for good reason. The roads are winding narrow, icy, steep, and dangerous. The trees became a blur and I struggled between hiding my face behind the driver to avoid the wind chill or looking so I could anticipate my death. The man leaned through every curve and my fingers clawed his jacket. I saw two logging trucks and thought we were dead. Somehow he stopped the sled in time. I took this opportunity to voice my opinions to the driver. “You’re scaring the life out of me.” I told him hoping he would adjust his speed. He did. Faster. It took less than ten minutes to go five and a half miles, and it seemed like the roller coaster ride from hell to me. The green sign proclaimed my freedom at the end of the forest. Stiff with fear and cold, I exited the death machine. “Thanks for the ride,” I said shaking “and sparing me my life.” He smiled, turned around and sped off. I hopped into the car and warmed up with the heaters. Lessons three and four: Snowmobiles break. Use caution accepting rides from unknown snowmobilers. After fixing the snowmobile, I went for a long time without incident, riding the regular fourteen-mile round trip to get mail and supplies. It was a long winter with lots of snow and I got to walk two more times before the end of it. The first time I crossed over a drifted area while turning, the outside ski sunk and the snowmobile flipped on top of me. 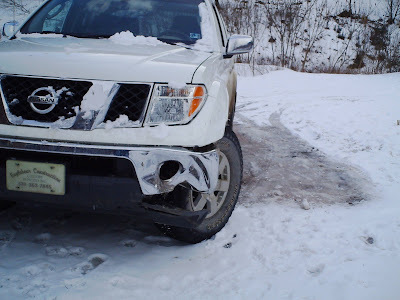 Although unhurt, I could not right the snowmobile myself and walked home. By now the sight of me walking to the cabin had Lee dressing and asking me how far the snowmobile was this time. Our last walk was the longest one-mile carrying a come-a-long and enough cable to pull the snowmobile out of deep wet snow. During my first year snowmobiling I had been stuck five times. I am hoping for some redemption this year. Note: I have continued to improve over the last 5 years and have made fewer and fewer mistakes. I don't take ride from strangers! Guess my mom was right! I have added this picture of the front so you can compare to the front of the old Stratton place easier. You can see a big difference. The second picture shows the Wilsbach camp"Valley Hi" as it now looks from the back. I did the remodeling on it which added this large area to the back and left side as you view the picture. hangs inside the new addition to Valley Hi. This is the Herre Camp from the files of Fran Weigley. Another picture from the 30's. You can see that there isn't a garage on the building like there is now. The most startling difference is the trees. The entire mountain behind the camp seems bare compared to today with tall pines so thick you can't see much of the hill. It is amazing what nature can do in a short period of time to change the landscape. We got more snow tonight and are scheduled for my favorite: "wintery mix," which means everything nature can think of will come out of the sky. Where did Spring go? Have a great Leetonia day! Mountain girl, Paula, logging out. Here is another picture from the files of Fran Wiegley. 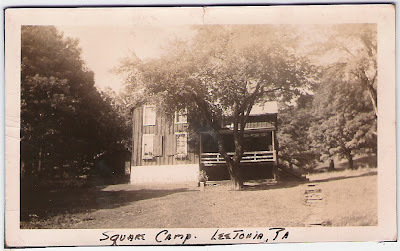 Her family lived in this camp, which she called the, "Square Camp". It is now owned by the Cassel family. 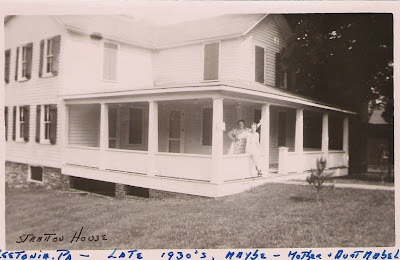 Although there is no date on this picture is appears to be taken at about the same time as the bear picture during the early 30's. The camp is now aluminium sided but the shape hasn't changed in 75 years. 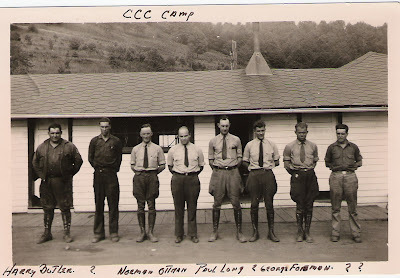 Fran's Dad worked with the CCC boys during the period of time Fran lived in Leetonia. I have more camp pictures she has sent and will post another one tomorrow. The cold temperatures has caused me to unthaw my water line to the well the last two mornings. It is not pleasant temperatures, we currently have light snow, which is supposed to get heavier this evening. Snowmobilers should be happy today, since it has been a pretty poor year for snowmobiling so far. I went through a cart load of wood in less than a day yesterday and today looks about the same for wood burning. Stay warm and if you live somewhere warm try not to gloat about it. Mountain girl, Paula, logging out. A special thanks to Fran Weigley, who with the help of her niece scanned and sent me this picture. 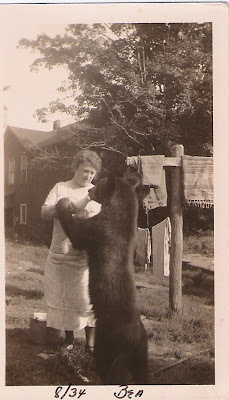 This is her mother in Leetonia, August of 1934 bottle feeding a bear. The bear is not very old, but is still large enough to do some serious damage to your arm when you run out of milk. It looks like the bear has a nice hold on the arm. I am wondering if Fran's mother had any scratches after feeding the bear. I would NOT suggest trying this activity. Although I am sure you could get a bear to cooperate it might not end nicely. Fran sent a bunch of great pictures of camps in Leetonia during this period and I will try to get them up soon for you all to see. You might see your place. Mountain girl, Paula, logging out. Well we have gone from record high temperatures and thunderstorms with lightening to this in two days! The creek at Cedar Run went up to 8' which must be some kind of record. The creeks made so much noise it kept waking me up. You think a truck is driving down the mountain. Yesterday we got 4-6" of snow and the snowmobilers are running today. Now the wind has picked up and the temps are dropping fast. This is the kind of weather you just want to hug the fireplace. Hope you all stay warm inside today and Spring returns quickly. Mountain girl, Paula, logging out. One advantage of being in the woods near loggers is I can buy a tri-axel load of tree-tops for firewood. The first year I lived up here, I tromped around the woods looking for anything dead to load into the truck and haul home. 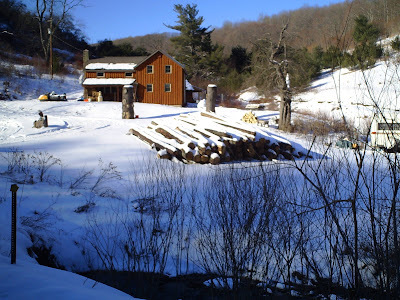 In a mountainous area it is difficult to get the wood down to your truck and I would often spend a day and be lucky to get more than 1 or 2 truck loads of wood. It takes about 6 full size truck loads to make a cord of wood and I burn about 6-8 cords a winter. You can see how time consuming this was. The other down side was I couldn't get into the woods when it was muddy, which was usually the time I had off from work. It was also hard on the truck and I spent a lot of money on gas to drive around finding wood. In one load I get about 10 cords of logs for around $500 delivered where I can cut and split them in my spare time regardless of how muddy the forest gets. I decided to get a movie of this for those of you that have never seen a logging truck in action. These guys that run them make it look easy, but I am sure it is not. They run up and down these narrow roads in all kinds of weather. Meeting them on an icy narrow road is not fun, its not fun when the roads are good. Coming to a complete stop has proved the best tactic as passing is often defined in inches not feet. Have a great Leetonia Day and be glad you won't be meeting any of these trucks on the narrow roads of Leetonia today. Mountain girl, Paula logging out...or should I say cutting out. The Leetonia Ground Hog came out in full attack against then continuation of winter yesterday. Although, we had about 3 inches of rain/sleet/snow/ice covering everything he did not see his shadow. This however was not the only sign of Spring. We actually saw a dozen Robins. The earliest ever sighting of this bird, I or anyone else can remember. We all felt sorry for them unable to peck through the frozen ground and wonder if they are going to break down and eat seeds from the bird feeders. Something I have never seen a Robin do. But I have never seen a Robin on Feb 2nd before. We still have a lot of firewood left on our porch this year. This represents a warmer than usual winter so far. If we make it through February without using much wood we might have some left over for next year. This is a much better thing then not having enough wood to make it through the winter as we feared our first and coldest winter here. So for all you Leetonia lovers take heart that mild days are in our future and the time to come to camp is closer rather than farther away. Have a great Leetonia day. Mountain girl, Paula, logging out!